Picture this: An orchardist following an IPM protocol identifies a pest that poses an economic threat. 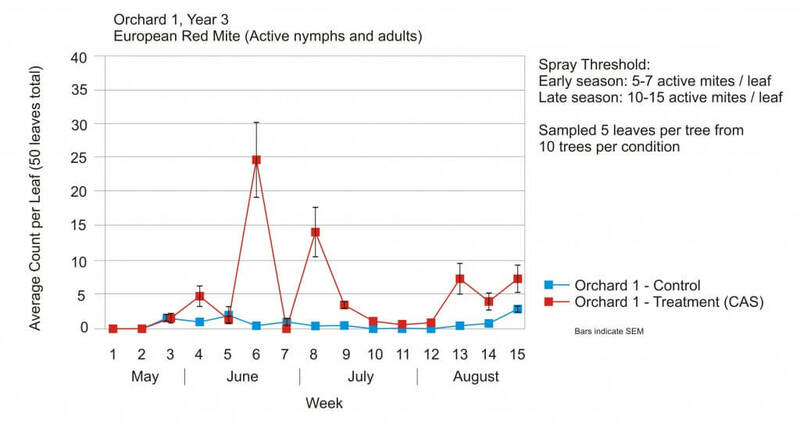 This is no surprise because it’s an annual pest and spraying is only a matter of when, not if. The operation is 150 acres and runs three airblast sprayers; two have a tower and one does not. Multiple varieties are planted in several blocks on different rootstocks and they are at different stages of maturity. The newer blocks are trellised high density trees and the older blocks are semi-dwarfs on different row spacings. Just for fun, let’s imagine the pruning team hasn’t finished yet, so some trees are not pruned. Fortunately, the orchardist has the pesticide label to guide them! It helpfully prescribes a range of doses per planted area, depending on the pest pressure. It advises that the orchardist mix an absolute amount of product in “enough water” to ensure the tree is sprayed “to the point of runoff” ostensibly assuming that if the tree is saturated, it will have received the “correct dose”. Our protagonist recognizes that this label is vague, and elects to rely on what has worked historically: A water-soluble pouch is dropped into each tank (close enough), and each sprayer operator is instructed to drive at an efficient speed (get it done because rain is coming), spraying until the tank is empty (which means they must have hit the target). If a tank is running low before the job is done, speed up and stretch it. If the spray is overshooting a younger planting, turn off the top nozzles. It’s a fanciful scenario, but I’ll bet you recognize your own operation in there somewhere. The question is: Is there a problem with spraying this way if it results in a respectable crop of quality apples? Agricultural engineers specialising in application technology in Spain, Australia, Great Britain and the United States say there is a problem, and on behalf of Canada, I completely agree with them. The fundamental problem is inconsistent spray coverage and excessive waste (of time, water and pesticide) due to variability. Our scenario notes multiple sprayer operators, different models of sprayer, and a range of morphologies, orchard layouts and canopy management practices. International peer-reviewed journal articles stretching back to the sixties have conclusively demonstrated order-of-magnitude differences in the area-density of orchard canopies from one acre to the next. There can even be fold-differences in canopy area-density in the same planting as the season progresses. A label prescribing a fixed dose based on the area planted is not appropriate for any vine, bush or tree crop, and the result is that more crops are over- or under-sprayed than receive appropriate coverage. Potential spray loss and inconsistency before adjusting sprayer to match the canopy. Potentially improved spray coverage after adjusting sprayer to match the canopy. Beyond the immediate impact on efficiency, variability makes it difficult to diagnose pesticide effectiveness. As an example, there was a scab outbreak in Ontario a few years ago that elicited questions about timing, weather, product choice and resistance. There was very little attention given to spray coverage, which in my mind should have been the first question if only to eliminate it as a potential culprit. This is because each operation interprets labels differently, and very few confirm coverage in any quantifiable way. This practice makes it difficult to identify a cause when crop protection fails. That was a lot of preamble to describe an issue that many orchardists are already aware of. What is needed is a way to adjust the amount of pesticide per unit ground area (i.e. the label’s prescription) to achieve consistent foliar coverage for canopies of varying shape and density. The concept is visualized in the following figure. In addition, the method has to be simple, intuitive and effective. Many models have been proposed to tackle this issue, including Tree-Row Volume, Leaf Area Index, Leaf Wall Area, PACE+ and DOSAVIÑA. There are advantages and disadvantages to each method. Standing on the shoulders of giants, we combined aspects of each of these models, including incorporating dose expression research from USDA ARS work in nurseries, to develop the Crop-Adapted Spraying (CAS) method. It is neither complicated nor sophisticated. 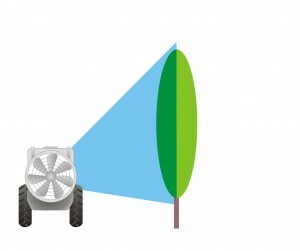 It formalizes a series of qualitative calibration techniques and the objective is to achieve a target foliar coverage pattern. When achieved with sufficient accuracy, pesticide efficacy is maintained and waste is greatly reduced. Perhaps I shouldn’t point out flaws before I describe the model’s effectiveness, but it’s important to understand that CAS relies on a few critical assumptions. The first assumption is that the sprayer operator’s typical ratio of formulated product to carrier is appropriate. We need a starting point for adjusting the amount of pesticide per unit area, and typically the label is too subjective. Further, the operator might be tank mixing other products and electing to reduce the dose of each tank mix partner, or adjusting the ratio of product to carrier to reflect pest pressure. The appropriateness of this assumption is evidenced by a history of satisfactory pest control in the orchard. The second assumption lies in defining a threshold for sufficient coverage, and this is a real challenge. Applications can be concentrate or dilute. Some products (albeit few) are locally systemic while others have limited redistribution. Even the droplet size employed (e.g. A mist blower’s fines compared to coarse droplets produced by an air induction nozzle) will have bearing. So, how does one draw a universal line in the sand and say “this much is enough”? A literature review, combined with practical experience, has led us to propose 10-15 % coverage comprised of a minimum of 85 medium-sized droplets per cm2 as a reference point for satisfactory foliar coverage. 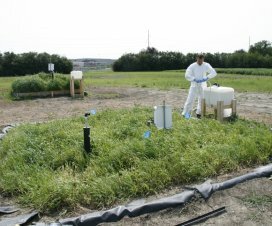 The figure is intended to be practical and versatile to safely represent sufficient coverage for most foliar insecticides and fungicides. It is not intended to be a rigorous, scientific absolute. For example, a drench application, such as streptomycin or dormant oils, will obviously require more coverage. Plant growth modifiers like thinners, stop-drops and foliar nutrients may or may not, and have their own unique criteria. It is the nature of models and assumptions that they may not hold in every situation. But, they allow us to define a fairly simple and robust method that we have tested in Ontario for the last three years. The sprayer should receive all seasonal maintenance prior to first use and undergo a visual inspection before each spray day. 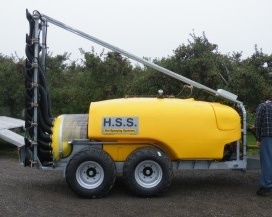 Park the sprayer in an alley between rows of trees and tie 25 cm (10 in) lengths of ribbon to the ends of the deflectors (if present) and the nozzle bodies. Turn on the air and extrapolate where the nozzles and deflectors are aimed. Adjust deflectors and turn off nozzles that will spray over or under the tree canopy. Consider using air-induction hollow cones in the top positions of each boom to reduce drift. You may have to increase the rate in those positions to compensate for the fact that nozzles producing larger droplets produce fewer droplets. Confirm ground speed with a half-full sprayer in the orchard using GPS or a calibration formula. Affix 25 cm (10 in) ribbons to far side of three trees. Tie them at the top and at the widest portions of the canopies. Drive past in the spraying gear at the ideal RPMs with the air on, and ensure the ribbons waft outwards. This will determine if more/less air is required from the airblast sprayer, and if operator should speed up or slow down during spraying. This is also an opportunity to perform Gear-Up-Throttle-Down if sprayer is using a positive displacement pump. Place water-sensitive paper at the top, centre and bottom of the tree canopy and spray water. As an approximation, if coverage exceeds 10-15% surface-area and 85 discrete droplets per square centimetre, reduce output in those positions by replacing nozzles with lower outputs. If less than ideal coverage is achieved, increase the nozzle rates in those positions. Excessive coverage may be unavoidable in the outer edge of the canopy, given that spray must pass through to get to the centre. Be aware that ambient wind speed and humidity have significant impacts on coverage. Therefore, only test coverage in conditions similar to your typical spraying conditions. When the canopy grows and fills in sufficiently, usually after petal fall, repeat steps 4 and 5 (this is typical for semi dwarf, but likely isn’t required for young and/or high density plantings). If you are suspicious that the spray is being stretched too thin or you are unsatisfied with the coverage, you may have to increase the output. This is more of an issue with larger trees. 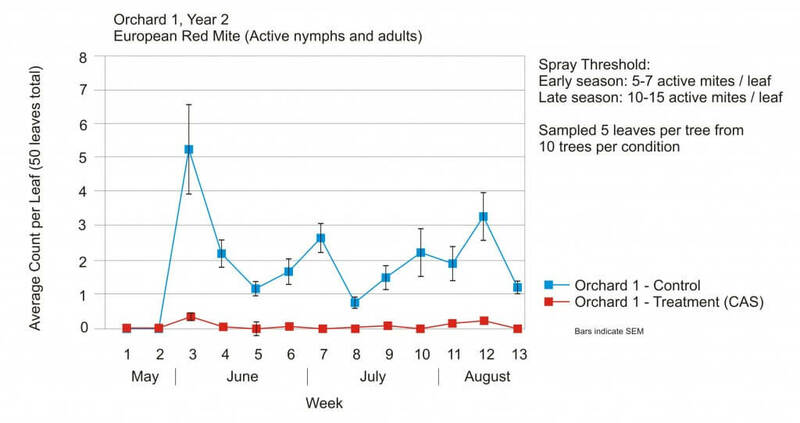 Early in the season, wind travels relatively unimpeded in a high-density orchard and will blow the spray off course, reducing coverage and requiring higher water volumes or possibly more air to compensate. As the trees fill in, the average wind speed is reduced and more spray can impact on the target. Therefore, increasing spray volume after petal fall may not be required in a high-density orchard. When the correct sprayer settings and volumes have been determined, the operator will mix their spray tank as they would for their typical application. 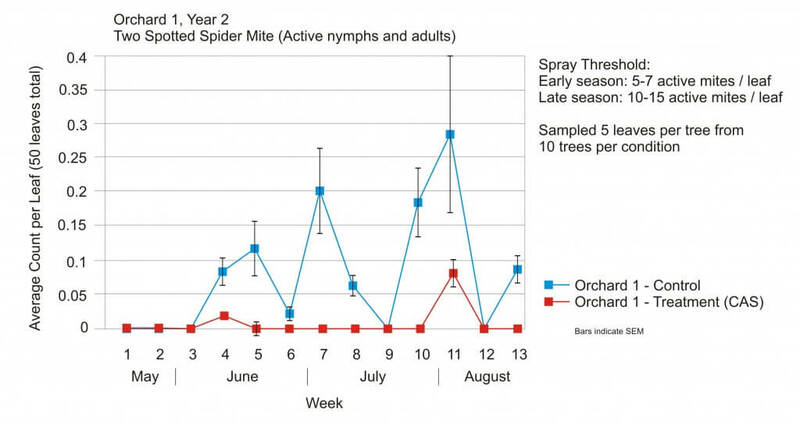 The sprayer will likely cover more orchard than it has in the past, and the operator will have to re-assess how many tanks are required pre and post petal-fall. It is not advisable to go below 400 L/ha (~40 gpa). This is where OrchardMAX (the CAS calculator app) helps the operator choose the correct rates for each nozzle position. This method of application is really no more sophisticated than turning off nozzles that are aiming at the ground or above the target. It will take time for operators to get comfortable with the new volumes (and potentially reduced dosage) and regular scouting is highly encouraged to confirm they are achieving control. Three Ontario apple orchards (and one Nova Scotia orchard) agreed to test the model. A block of trees was randomly selected from each operation to serve as the treatment condition. These trees received spray according to the CAS model. The rest of the orchard was sprayed according to the grower’s traditional methods. The orchards included several varieties and represented both semi-dwarf and high density plantings. According to the model, each grower sprayed anywhere from 20-35% less per hectare in the CAS block than in their traditionally-sprayed block. In many cases, the overall canopy coverage was improved in the CAS block compared to the traditional method simply by aiming formally wasted spray into the canopy, and reducing volume in those areas that were unnecessarily drenched. A scout was dispatched to monitor insect and disease activity each week for ~15 weeks. They observed a typical IPM scouting protocol and were not informed which block was the traditional control and which was CAS treatment. Data was transformed where appropriate for analysis of variance. In almost every case, there was no significant difference in counts between the CAS treatment and the grower’s traditionally-sprayed control (p=0.05). In those few cases where a pest had higher counts in the CAS block, the counts were so far below a spray threshold as to be insignificant. If we look more closely at the three (of 128) ANOVA comparisons of control to treatment, we see that economic thresholds are rarely an issue, and essentially, difference between control and treatment are moot. This study was repeated over three years. Having examined the data to determine if three years of optimized doses had any effect on pest populations, results suggest no such effect. Apples were randomly sampled for destructive analysis at harvest and the total counts of any and all damage are shown below. This is simply a tally, and no statistical significance is implied. 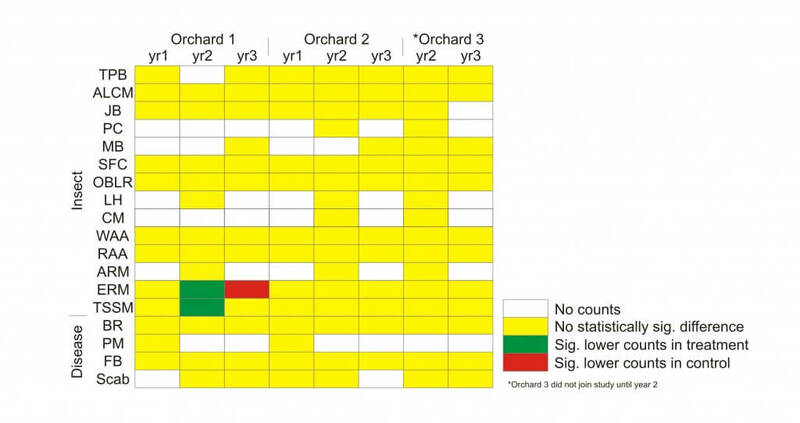 Note that Orchard 3 was only involved in the study for two years, and unfortunately a killing frost destroyed their harvest in their second year. An important part of knowledge transfer is whether or not growers will choose to adopt a method once the instructor is gone. By year two the biggest challenge was ensuring the orchardists in the study continued to spray the control block at their traditional volumes! They were more than willing to adopt the method wholesale and all three will do so starting in 2016. 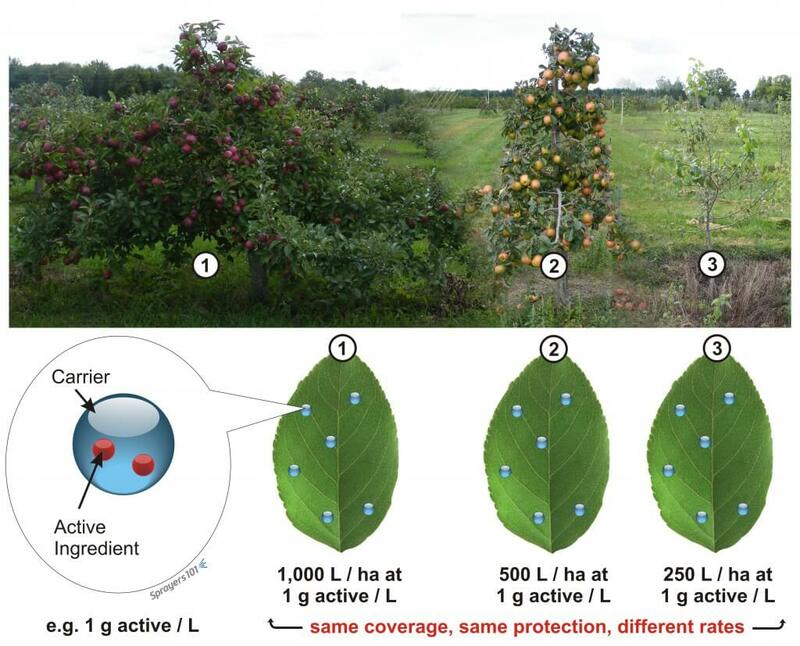 Further, colleagues in Nova Scotia have been performing their own CAS trial for the last two years, and report no significant difference in pest activity or apple quality. They’ve done so simply by following a written protocol. The orchardist’s enthusiasm, the ability for the study to be replicated without my direct involvement, and the successful results speak to the viability of the method. As of November 2015, we are beta testing an app for Apple and Android smartphones that will help a sprayer operator determine the best sprayer settings for their orchard. Information about the sprayer and orchard block is entered only once, and product information and a few specifics about the orchard are entered the day of the application. 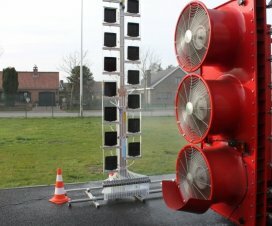 The app will then propose a nozzling solution for a conventional airblast sprayer as well as describe how much product and water should be used per tank. It then creates a permanent spray record. The app still requires the sprayer operator to follow the sprayer calibration method, and coverage should be confirmed with water sensitive paper. This software was used to determine the sprayer outputs for our three year study and will be available for free download through this website in time for the 2016 season. I would like to thank the researchers that developed the methods CAS is based upon, statistician Behrouz Eshani, the orchards that cooperated in the study, my OMAFRA colleagues and the OMAFRA summer students that scouted those orchards for three years. 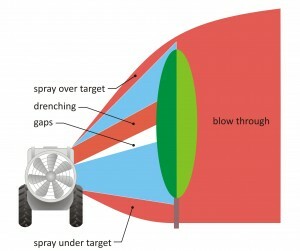 The maintenance, calibration and operation of an airblast sprayer is an involved process. Collectively, the sprayer setup, weather and crop morphology all influence the coverage obtained from an application. A fundamental understanding of application technology is required before attempting to optimize dosage using the CAS method. For more information about airblast spraying, download a free copy of Airblast101 – A Handbook of Best Practices in Airblast Spraying. You can pan through this slide deck promoting and explaining the process. If you’re having trouble seeing the presentation, you may need to update your browser. Finally, take a few minutes to watch this video by AAMS-Salvarani. 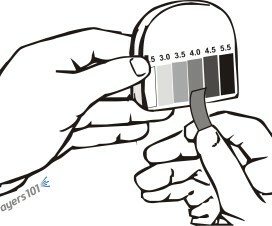 In many European countries such as Belgium , France and Germany, sprayers must be calibrated regularly. While there is no mention of air speed adjustments, many of the steps in this video correspond with the airblast adjustments relating to Crop-Adapted Spraying.